Many independent professionals fall into the trap of chaotically hoarding reams of receipts to deal with at a later date. With inniAccounts, the once onerous task of keeping track and safely storing your company’s receipts becomes effortless; whether you’re using a computer, a smartphone or both. With the new feature, you can easily capture an electronic copy of your receipts for your records, create new transactions from your receipts or simply drag and drop your captured receipts to attach them to existing transactions you’ve already raised. Receipt capture allows you to save time by storing all your information in one easily accessible location. By attaching your receipts to their appropriate transactions, your inniAccounts Bookkeeping contains everything you need to remain compliant with HMRC. With our mobile app, you can capture and manage your receipts on the go, so nothing goes forgotten or missed. It’s important to ensure all your company’s transactions are accurately captured and evidenced through auditable receipts, orders, delivery notes etc. Failure to do so will lead to compliancy issues with HMRC. You can find more information on Bookkeeping with inniAccounts here. The vast majority of accountancy services use third parties to provide added extras; such as receipt capture. 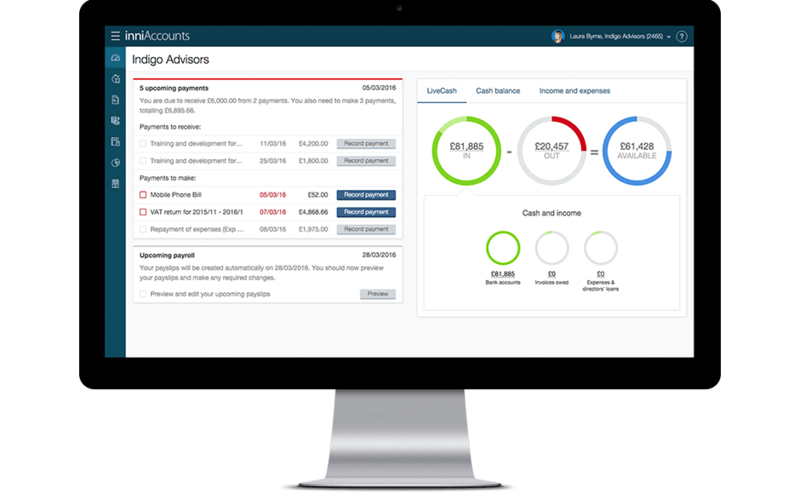 Here at inniAccounts, we’ve worked to develop a feature that’s as specifically tailored to contractors and consultants as the rest of our software is. All for none of the extra fees that tend to come with third party involvement. We recognise that safely storing your receipts and managing them alongside your company’s Bookkeeping is an essential part of running your business. So, we’ve worked to provide a singular in-house experience, specifically designed as an integrated part of our software; for no additional costs. HMRC requests all receipts (including those related to your VAT records) are retained for at least six years. With our new feature, it’s easy to go paperless knowing a copy of your receipt is securely kept. Anything you upload will be safely stored in your inniAccounts software. So no more worrying about that ever growing box of crumpled paper receipts, your phone being stolen or updating your computer – we’ve got you covered. Here you’ll find a detailed explanation of the three easy ways you can be using the receipt capture feature alongside your day to day Bookkeeping. Our receipt capture feature currently supports Image Files such as JPEG & PNG. Nowadays you can receive receipts for the purchases you make in several different ways; a print out from a till, within an email, from an invoice or a PDF. By immediately capturing your receipt electronically, you no longer need to worry about the original copy getting misplaced. Within the inniAccounts software, select Documents & receipts in the Navigation bar. Here you’ll find your Receipts. This is your captured receipt storage area, where you’ll find all the receipts yet to be processed as well as a history of the receipts that have been processed and the transaction they’re allocated to. A Dashboard message will remind you if you have any outstanding receipts yet to be assigned to a transaction. You can now quickly attach receipts straight to transactions. Within the software just drag and drop an image of your receipt onto the relevant transaction line. Where there is already a link to the transaction stored in the software, for example when the transaction involves your invoices or payslips, you’ll find a quick link on the right-hand side that will directly take you to them. For more information take a look at our Bookkeeping guide. It’s now easier than ever to manage your receipts while on the go. By getting into the habit of snapping an image of your receipts as you receive them, you can save time and ensure all your receipts are safely stored without any chance of them going missing (all the while keeping your company’s Bookkeeping accurate and up to date). Got a business receipt sitting in your wallet? Why not give it a try now?